Selina Lopez is a third-year student at the University of North Carolina at Chapel Hill (UNC). Throughout her time at UNC, she has been involved with an organization titled Scholar’s Latino Initiative (SLI) as a mentor and co-leader of the parental involvement program, SLI-Familia. Lopez shares insights about her current role with parents as well as reasons that inspire her to be engaged. She shares various challenges that parents face as they work with students throughout the college application process and mentions efforts SLI is taking to better educate parents about the process. Furthermore, Lopez provides recommendations that should be implemented to ensure the involvement not only of the students but also of the parents, as she recognizes that they are an important aspect of the support system for students. There is also a brief discussion of how factors such as immigration status, language barriers, and cultural differences may place challenges for parental involvement during this crucial time for high school students. Vianey Lemus Martinez: I am here on April 16th at 1:30pm interviewing Selina Lopez. We are currently at the University of North Carolina at Chapel Hill. Can you please state your full name and whether you consent for this interview to be recorded? Selina Lopez: My full name is Selina Lopez and I do give permission. VLM: Thank you Selina, could you please start by telling me more about your involvement with SLI. SL: This year I am a current co-chair for SLI-Fam. What SLI-Fam does is work with the mentee's parents where we try to get them to be more involved with the academic life of their student. VLM: Great, can you tell me a little bit more about how you personally---, what kind of work do you do to help parents to have this role with the students? SL: Basically Laura, my other co-chair and I, we get together on Sundays when we have academic events and we make lessons plans geared to educating the parents on important themes such as financial aid or the general college application process. Our goal is to get them informed about this process. We realize that a lot of these parents, like their students, are first-generation college parents in a way. They do not know anything about college because they themselves did not have that opportunity to go. VLM: Of course. Based on your experiences with SLI, how would you describe the current involvement of parents? SL: Could you explain more on what you mean by? VLM: Yea, yea for sure. With this question, would you say that parents are very receptive of the information you give? Would you say that parents--. Which parents would you say that mostly participate in the program? Which don't? What kind of dynamics do you see within the group of parents? SL: Definitely our sophomore parents or the newly admitted class group of parents are the most involved so far. I think they have expressed various times how thankful they are that Laura and I are trying to teach them these themes because they do not know anything. They come in not necessarily knowing anything so we have to start from level zero. For example, one class period we spent talking about how to calculate a GPA because they did not know what a GPA was. So, through that like---. That was one of our first lessons. Through that lesson we realized, "Wow, we actually have to step back and go a lot slower than we anticipated". I would say that parents in general have always expressed their general gratitude for what SLI-Fam does for them. The difficult part of that would be that parents from previous years such Junior and Senior year, I guess because they did not get trapped, not trapped, but engaged from the beginning they did not see the importance of coming to the SLI-Fam lessons. That is something that sophomore parents especially, Laura and I really tried our best to get them engaged and tell them the importance of why they need to be there. VLM: Ok, thank you. Again from your experiences, what challenges do you think parents face when working with students who pursue a higher education? SL: Definitely that barrier in knowledge. Parents, like their student, they do not know anything about how you would pursue a higher education, they just base it off of what their student tells them. Most of the time students do not even try to explain to their parents or they feel like stressed themselves to try to explain it. Parents just assumed that their child is doing fine and what they have to do. I think that is one of the challenges that we did see among the parents. They just relied a lot on that their student being okay and that they are having other resources and sometimes they did forget like "Hey I do have to be a little bit involved in my student's academic career. Just try to support them better." VLM: Do you think that for example, barriers such as language barriers or educational barriers were also another challenge that parents face? SL: Yes, definitely because SLI-Fam we teach in Spanish which is probably a great thing because some parents do speak English but some are not proficient or feel comfortable speaking in English and some did express during the year they did not feel comfortable addressing someone like an Anglo-speaking person if they even had questions. I think that langue barrier for sure is another challenge, especially for Latinx parents. VLM: Some studies and people in general tend to think of Latino parents as being very uninvolved in the education of students, sometimes even have said them to be careless about the education and not pushing students enough. How would you respond to this bed on your experiences working with them? SL: I think that they are not seeing things from the whole perspective. I think that parents, especially Latino parents---. I know that from my personal experience that my parents even though they were not involved in my academic journey, just with their encouragement and support, like basic "Hey you, go to college, you go have a better life for yourself. You have the opportunity that we did not have." Words like that, sayings like that drove me to pursue education. So I think that perhaps these critics are not necessarily taking into account the culture and the barriers they do face. Not looking at all the different perspectives. Not looking at what they do do. They make sure that their child goes to school, they make them go to school even if the child does not want to. Even though they do not know anything, what happens at school sometimes, but they know that school is good so they force them to go. VLM: I think also for Latino parents, especially those that are first generation in this process. For many we can assume that they may also identify as immigrants whether this is recent or first-generation immigrants to the country. How do you think their migration experiences or status affects their role in education, of the parents or the students? SL: I think that is also another big barrier that parents face as well. They have the fear of like you know, especially if they are undocumented, they are less comfortable to be involved because of the fear that they might get caught of being undocumented and therefore cause a problem for their child or even themselves. That is definitely another big barrier that is not usually taken into account. VLM: What are some of the things that you would hope could change in regards to the parental involvement, whether this is in general with college access programs or specifically with SLI? What are some of the changes that you would like to see? SL: Specifically, with SLI, I would like to see more older generation parents be more involved. We have a pretty good number of sophomore parents that we think are already engaged and like SLI-Fam and like listening to the lesson plans that we do have planned for them. But reaching out to the Junior, older mentee classes their parents that would be nice to have more response from them because I think that parent involvement is really important. Not to say they do not do enough already because parents do have a very big role; without parents their students their student would not be where they are in that current situation. If they were to be more involved the student would see, feel more supported because they see their parent trying to be involved during their academic journey, which would push them more. Yes, make them generally happy that their parents are involved and care. VLM: For sure. You mentioned or we talked about some of the steps that hopefully parents could take to be more involved. What are steps that you think SLI itself could take? I think they are already a step forward by having this space that is specifically for parents, but what do you think are other things that SLI could do to involve parents more or make them feel more welcomed to the program? SL: Definitely incorporating them more in their program. What we have seen so far is that they focus a lot on the mentee class, which is great. But I think if parents feel welcomed from the start, I feel like they would be more willing to come, or be willing to share their time on Sundays when they could be doing something else; they could be running errands but the parents, some of them decide to stay and go to the class. For next year for sure we are planning to do like pre-informationals about what SLI, so parents have an idea of what their responsibility would be within SLI before the program actually started. One of the things we did realize is that again is that the student does not really communicate regarding the program or logistical things. When we were in SLI-Fam, the first day of class, most of the parents did not know what SLI was or what the program actually did, so we had to go through that. Even throughout the year, we had to reiterate things that were going on the rest of the month because they said their student does not really communicate what is going on or when the next event is. We figured that having that direct contact with parents themselves would be best to communicate and get them engaged. Also, I think that would be helpful for them to create like a community within themselves. That is something that we noticed this year. A lot of the parents used each other as resources, which was great to see because parents came from different sites so they would only see each other like twice a month and they would like "hey how are you? How is work going?" They would have nice side conversations and joke around. It was really nice to see the community building towards the end. That was nice. VLM: Yea, definitely, I think you mentioned a little bit more about your experiences but what are perhaps some specific instances that you remember through your work with SLI that kind of motivated you to keep doing this work and keep being involved with parents? SL: A big drive for me is remembering, going through the whole college process, remembering my parents not necessarily being directly involved. They were there in the background as a support and as an encouragement system. But I know that as a student, as a High school student, I wanted them to know or have a general idea of what I had to go through or the process itself. That is one of the big drives for me to do that for the parents of SLI. So they can gain a little bit of knowledge so they know how to better support their student and help them. Realize like "hey my child is going to have to take this standardized testing, let me be at least considerate and be like hey I'm willing to pay for like an SAT prep-course class or something. Or be okay with spending or taking you to the library to study for like an hour or two on Saturday instead of doing chores. I think that that is something that drives me. Within SLI, I saw how parents---. Well a comment that a mom said was that SLI-Fam, the thing she learned really help her communicate more with her student and that they communicate more. They communicate better in relation to academics. She feels like she understands her son a little bit more and what he is going through; that is turn has made their relationship a little bit better because communication is on point. VLM: Definitely. Sorry I am trying to get my train of thought. Is there anything else regarding your experience with SLI parents that you would like to share about? SL: I kind of have this thing where I say that the SLI parents are like my kids even though they are older than me. But I really do love seeing them during each academic event because they are coming and willing to learn whatever we teach. They always try to be engaged. That motivates me because it shows me that they do care and they want to better support their child. We are giving them a resource to do that. To see their motivation and engagement in class, in participation---. We do have some shy parents, sometimes they do not to say like the wrong thing because they do not know a lot of these themes, they do not want to say what they think or their opinions. I think it is Laura's and I constant reassurance, like hey it's ok if you do not know anything. This is totally a safe space. It is ok to admit that, because we kind of know that you do not know anything, which is why we are here to help you. It is really, it's really great because I feel like we try to make it really comfortable for them to be themselves. It is funny because you would think that as adults they would not care how they acted in a class but it is the same social norms as students. They are still shy, they do not want to say what they think, so it that technique to get them more involved, trying to get them to participate ad finding methods that portray the theme or message across better. I think that is something I have really come to love about SLI-Fam. Also them as individuals, they are parents and they have these funny sayings and they know that we are students so they would be joking around like "Oh when I meet your mom I am going to tell her this" or something. We try to be funny and crack jokes, well mostly me because Laura is a little too serious. But we try to make it really comfortable for them so they can feel free to open up and be themselves. VLM: Thank you, I think just one last thing that I would like to ask you about. I know that because of this program mostly works with Latino high school students, I am assuming that most of the parents are also Latinos or they identify as Latinos with this culture. How do you think that SLI has to, or you and your co-leader, have to accommodate the way that you all work to kind of fit in cultural differences? In general, how do you think the fact that these parents are Latinos or come from a Latino culture, how do you all take that into consideration when you are planning, when you are having discussions or when you select topics that you talk about? SL: I think one thing that makes it a little easy, is that most of them are Latino parents and because we are Latina, we know what topics or what to say, I guess if that makes sense. We know based on they being first generation college parents or future college parents, they are not going to know a lot of things. I think that one thing we did not expect coming in to SLI is exactly that. Them not knowing anything, having no base or foundation on a lot of things. Finding the way to explain it in a very simple, but detailed way for them to grasp the idea or the topic if the topic was hard or is hard to do. I think that is why we have trying finding videos and of course incorporating Spanish. Using Spanish in the classroom instead of English because some parents, they do not necessarily feel comfortable with English, so accommodating to that. I know that sometimes for me personally it is hard because I do forget words in Spanish and have to stand there while awkwardly try to remember how to translate it. That is one of the things that we have to take into account when---, taking into account their cultural--, especially taking into account their age and the generation they come from. They may not necessarily understand example we give. So we have to put ourselves in their shoes, or in our parent’s shoes and come up with good examples or things that we would think they understand. VLM: Yea, is there anything else that you would like to share? SL: No, I mean I love SLI-Fam. Go parents! VLM: Awesome, well thank you so much for sharing your experiences. I really appreciate this. 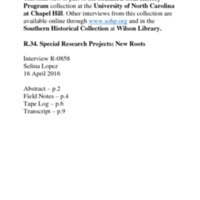 Interview with Selina Lopez by Vianey Lemus Martinez, 16 April 2016, R-0858, in the Southern Oral History Program Collection #4007, Southern Historical Collection, Wilson Library, University of North Carolina at Chapel Hill.